Greater Victoria Shakespeare Festival celebrates 25 years in 2015 with 25 alumni. I can’t imagine a more wonderful way to spend an evening outdoors than enjoying live theatre–I’ve written often about the experience at the Greater Victoria Shakespeare Festival on the grounds at Camosun College’s Landsdowne Campus. Over the past few years the society has improved the staging (constructing the Camus portable stage) and in 2014 moved to a repertory model with professional mentor actors (this year they are SarahJane Pelzer and Trevor Hinton–familiar to audience members for their work with Blue Bridge Repertory Theatre, Atomic Vaudeville, Ride the Cyclone). 2015 promises to be quite magical–Britt Small (well-known as the co-founder of local troupe Atomic Vaudeville) and Christopher Weddell (an original co-founder of Vancouver’s Bard on the Beach and teacher at the Canadian College of Performing Arts among others) directing Midsummer Night’s Dream (a personal favourite) and Romeo and Juliet (which I have never seen staged live!) respectively. Here’s is a brief history provided by Festival Artistic Director, Karen Lee Pickett. 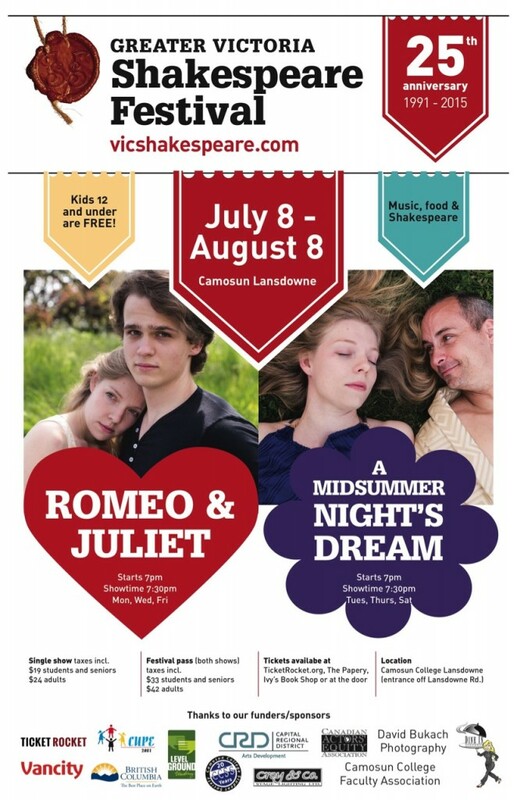 When The Greater Victoria Shakespeare Festival opens on July 8, 2015, with Romeo and Juliet and A Midsummer Night’s Dream, the Festival will be celebrating 25 consecutive years of bringing the Bard’s classic works to Victoria audiences. To celebrate its 25-year history, the Festival is highlighting the many actors, designers, musicians and other theatre artists who have contributed to making the Festival indispensable in the arts community. Hundreds of theatre artists have worked with the Festival in its 25 years, from well-established professional and community actors and directors, to musicians, technicians and designers. The Festival has also nurtured many new and emerging artists who have gone on to work in traditional and experimental theatre internationally as well as having successful film and television careers. Other performers and festival artists have gone on to other endeavours. Square space before Theatre Inconnu joined with Island Repertory Company to produce the Victoria Shakespeare Festival at Ship Point in Victoria’s Inner Harbour under a red and white striped tent to sellout crowds. The Victoria Shakespeare Festival remained in the Inner Harbour for a number of years before moving to St Anne’s Academy for a lengthy run, both inside the Academy’s performance hall and on its lovely grounds. When it appeared the Festival might go dark, the Victoria Shakespeare Society was founded and the Festival was given new life. The first year the Society produced the Festival, performances were given in Centennial Square, and in 2005, the Greater Victoria Shakespeare Festival moved to its current home on the grounds of Camosun College Lansdowne Campus where it has produced 10 years of critically acclaimed productions. Tickets are $24 and $19 for students and seniors. Regular tickets available through TicketRocket, or at the door.